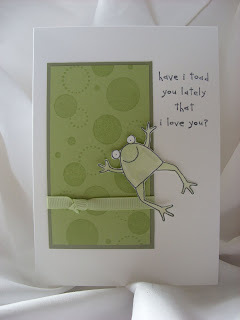 I seem to have a fascination with this frog recently and he is definitely on my most used list but isn't he lovely?! This card is one which i use as a make and take at my home workshops so if you'd like to have a go with this little cheeky chappy and you live in Cornwall then contact me for more information about having a Stampin' Up! Party in your home, and see if we can earn some more fantastic people some excellent freebies!!!! This card is made using Whisper White, Certainly Celery, Mellow Moss card stock with Certainly celery ribbon, I used the water colouring technique with an aqua painter on the frog and doesn't he look lovely. I used the spot on jumbo roller with certainly celery ink basic grey ink for the frog outline and celery ink to water colour. Greetings from Texas!!! I love this card it is so crisp....and I do love that cheeky chappy. I must say I love ur music too!!! When I hear that song I get so happy!!!! Die-hard HP fan. I am so glad I stopped by...you should come and visit me. Those frog stamps are so cute!